Do you have plenty of spare cash lying around, that you won’t mind forking out a premium for one of the better computers out there in the market? If your answer is in the affirmative, then we would be more than pleased to inform you that the new Mac Pro line has just been announced, where you will be able to enjoy up to a dozen processing cores and up to 50% more performance compared to its predecessor. Thanks to the inclusion of the latest quad-core and 6-core Intel Xeon processors, an all new ATI graphics card as well as the option to slot in up to a quartet of 512GB solid state drives (SSD), the new Mac Pro is definitely not pushover, delivering amazing performance and expandability that will keep even the most demanding consumers and professionals happy. Needless to say, the new Mac Pro is the most powerful and configurable Mac to date, where its next generation quad-core and 6-core Intel Xeon processors run at speeds up to 3.33GHz. These multi-core processors rely on a single die design, enabling each core to share up to 12MB L3 cache in order to further improve efficiency while increasing processing speed. Turbo Boost will dynamically boost processor speeds up to 3.6GHz, while Hyper-Threading technology can create up to two dozen virtual cores. Each Mac Pro will now ship with the ATI Radeon HD 5770 graphics processor that is equipped with 1GB of memory, and you can also choose to fork out more dough for the faster 1GB ATI Radeon HD 5870. Each Mac Pro purchase will be accompanied by Apple’s innovative Magic Mouse, and you can also opt to drop more dollars for Apple’s new Magic Trackpad if that is your cup of tea. Of course, we don’t expect you to use the Mac Pro for simple tasks such as web surfing and doing spreadsheets while typing out documents, but we don’t suppose it is wrong either to spend your money that way if you’re so inclined. 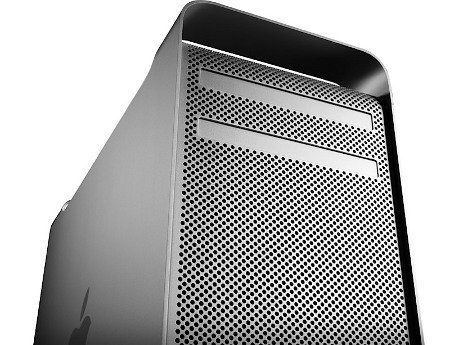 Expect the new Mac Pro to hit the market this coming August with prices starting from $2,499.99 upwards. Now is an Acer did this I would buy an Acer hahaha! Not even if it had 20 core processors would I buy an Acer laptop, those computers are piece of crap period but mac apples are awesome!